In the absence of an expulsion of Israel by FIFA, the PFF hopes that its campaign will ease Israeli impediments on Palestinian soccer. “It will force the Israelis to change their ways. Pressure is the only language that they understand,” said a Palestinian sports journalist. Mass protests against Brazil's hosting of the World Cup, Turkey's loss of opportunities to host sports events and controversy over 2022 World Cup host Qatar's labour system are impacting the global sports world's thinking about the requirements future hosts will have to meet. The impact is likely to go far beyond sporting and infrastructure concerns and raise the stakes for future hosts. Qatar is under increasing pressure to overhaul its kafala or labour sponsorship system denounced by the United Nations and labour and human rights activists as violations of international human rights standards. The Gulf state potentially risks losing its hosting rights if it fails to demonstrate rigorous enforcement of existing rules and regulations and enact radical reforms. The Qatar controversy illustrates the risk both potential hosts groups such as world soccer governing body FIFA and the International Olympic Committee shoulder with the awarding of tournaments to nondemocratic or authoritarian-run nations. FIFA has been heavily criticized for its awarding of the tournament to Qatar. FIFA president Sepp Blatter this week described the awarding to Qatar as a “mistake.” FIFA later tried to soften the impact of Mr. Blatter’s statement by saying he was referring to the fact that the awarding disregarded a negative FIFA technical assessment that warned about the country’s bruising summer temperatures. "Of course it was a mistake. You know, one makes a lot of mistakes in life. The technical report indicated clearly that it was too hot in summer, but despite that the executive committee decided, with quite a big majority, that the tournament would be in Qatar," Mr. Blatter said, sparking a soccer diplomacy spat, by charging that pressure by the governments of France and Germany as a result of commercial interests had contributed to the success of the Qatari bid. In doing so, Mr. Blatter perhaps unwittingly raised the question what the drivers for the awarding of sports mega events should be. "We know perfectly well that big French companies and big German companies have interests in Qatar. But they are not only involved in the World Cup," Mr. Blatter said. France and Germany have denied his allegation. Qatar, meanwhile, is caught in a Catch-22: its international image and the achievement of its soft power policy goals demand swift and decisive action; its domestic politics necessitate a more gradual approach. The risks in hosting mega events are for Qatar and other Middle Eastern and North African nations particularly high given that their significant investment is designed to achieve more than country branding and international projection and the creation of commercial and other opportunities. Mega events serve them as a tool to build soft power either as part of a defence and security strategy designed to compensate for the inability to acquire the hard power necessary to defend themselves or as a way of increasing international willingness to provide economic and political support in difficult geopolitical circumstances. Mass protests in Brazil against the World Cup, the first time a sporting association, FIFA, and an event, became the target of the protest rather than its vehicle, have further pinpointed the need to obtain public buy-in as part of the awarding process to prevent mega events from being mired in controversy and social protest. Brazil hosts this year’s World Cup and the 2016 Olympic Games. Finally, brutal police response to protests and a series of authoritarian measures to control the media, the Internet and the judiciary have cost Turkey the chance to host the 2020 Olympics as well as EURO 2020, reinforcing that fact that mega sports events cannot be viewed independently of a country’s domestic policies. Qatar however, provides the foremost case study to date of what potential future hosts of mega events may expect. Qatar has garnered significant credibility by becoming since the awarding of the World Cup the first Gulf state to engage with its critics and work with them to address issues. Yet, at the same time its credibility is being called into question by a history of promises on which it has yet to make good. Qatari institutions have in the past three years adopted lofty principles in response to criticism of its labour system, pledged to incorporate these into World Cup-related contracts and stepped up enforcement of existing rules and regulations. Those promises and principles have yet to be incorporated into law. At the same time, promises pre-dating the awarding of the World Cup such as a pledge in 2008 to introduce a low governing the rights of domestic workers have yet to be fulfilled. Human rights and trade unionists have charged that the promise this week to overhaul the kafala system, while easing some restrictions on workers’ rights appear to be more of a relabeling exercise than a radical reform, much like Formula-1 host Bahrain did several years ago. Qatar’s lesson for future host is that putting a country’s warts on public display is risky if it is unwilling or unable to proactively tackle sensitive domestic issues. The Jordanian hosts of last week’s Asian Forum of Soccerex, a major sports business conference that expanded into Asia for the first time, appear to have recognized which way the wind is blowing. Recognizing that global soccer governance and business is focused on the top end of professional soccer, they introduced debates on issues such as grassroots and women’s soccer into the debate. The Jordanians are also looking at including preparations for future World Cups in forthcoming Soccerex gatherings. Hosting the conference is part of a Jordanian effort to project itself as a significant and progressive player in international sports. Jordan is scheduled to host the 2016 Under-17 Women’s World Cup. 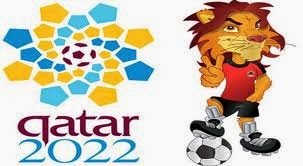 A long awaited and much hyped announcement on a reform of 2022 World Cup host Qatar's controversial kafala or labour sponsorship system has sparked more questions than answers and cost‎ the Gulf state an opportunity to gain the upper hand in a bruising debate that has significantly tarnished its image. Confusion over what the proposed reforms meant was such that Sepp Blatter, president of world soccer body FIFA, and Theo Zwanziger, the FIFA executive dealing with the Qatari labour issue cancelled a planned trip to the Gulf state. FIFA has come under severe criticism for failing to take harsh workers’ conditions into consideration when it awarded the World Cup to Qatar in December 2010. The confusion stemmed from the fact that the reforms appeared to involve a refinement of the kafala system rather than an overall overhaul or abolition as the government claimed. It was further fuelled by the announcement that future labour contracts would have to be in line with a model contract drafted by the government, the terms of which have yet to be disclosed. The confusion compounded the fact that Qatar in the way it announced the measures filed to convey sincerity by having a senior Cabinet official disclose the changes rather than a senior military officer in uniform. Also fuelling doubts was the fact that the reforms have yet to be sent the Qatari Chamber of Commerce and approved by the Shura or Advisory Council. It was not clear how long that process would take. The proposed reforms were announced in response to widespread criticism of the labour and housing conditions under which up to one million workers are expected to build massive infrastructure for the World Cup and reports that a significant numbers of workers have died on non-World Cup related construction sites since Qatar successfully bid for the tournament. Trade union and human rights activists as well as the United Nations Human Rights Council have demanded that Qatar abolish the kafala system which severely restricts workers’ rights, including their freedom of movement and right to seek alternative employment, and puts them at the mercy of their employers. “We still have many questions what is exactly meant by these changes. I don’t think these measures go far enough,” said James Lynch, an Amnesty International official, who has worked closely with Qatar to change the system. He said the requirement for workers’ to obtain an exit visa that was “completely illegal” according to international law and a “human rights violation” appeared to have not been completely abolished. Beyond disappointing those activists with whom Qatar has engaged, the announcement threatens to strengthen the hand of hard line critics, foremost among which the International Trade Union Confederation (ITUC), which says it has 175 million members in 161 countries. The ITUC has threatened to organize a boycott of Qatar if it failed to abolish the kafala system. ‎In a news conference, Brigadier General Muhammed Ahmed Al-Atiq of the interior ministry asserted that the measures amounted to abolition of the kafala system that puts workers at the mercy of their employer but that was not evident from the reforms he spelled out. 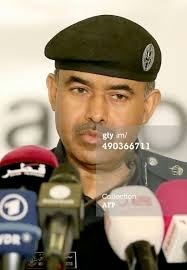 General Al-Atiq said kafala would be replaced by a system based on employment contracts. The general and other officials at the press conference refused to be drawn on the details or clarifications of the proposed reforms. Streamline rather than abolish the requirement for workers to acquire an exit visa before leaving the country. Instead of having to seek their employers consent before departure, workers would apply through an automated system operated by the interior ministry. The ITUC, which unlike groups like Human Rights Watch, Amnesty International and the International Labour Organization, a United Nations agency was not ‎involved in discussions about reform with Qatari officials said in a statement that the kafala system had been relabelled but was alive and well. One possible reason for Qatar’s bungling of the announcement of the proposed reforms is likely the lack of a domestic consensus on the need for change. Many Qataris, opposed a relaxation, let alone the abolition of the kafala system because they fear losing control of their society, culture and country in which they account for only 12 percent of the population if they grant foreigners rights. The proposed reforms further failed to address a concern in the business community that easing the exit visa requirement could potentially lead to foreigners running their businesses accessing company funds and leaving the country. At the other end of the Qatari debate, assistant foreign minister Sheikh Mohammed Bin Jassim Al Thani said in a recent interview with Al Jazeera that "the sponsorship system was set up at a different time and according to a different demographic composition… but today the situation has changed and due to the flow of the expats, we certainly need to carry out many changes." World soccer body FIFA has dispatched investigators to Egypt to probe allegations of government interference as the country prepares for potentially risky bids to host two international tournaments, the 2017 Beach Soccer World Cup and the 2018 FIFA Under-17 Women’s World Cup. The FIFA investigation and the bids come against the background of a military coup that last year toppled Egypt’s first and only democratically elected president and a presidential election this month likely to effectively cement the military’s grip on the country, which is marred by a brutal crackdown on regime opponents and political freedoms in which more than 3,000 people have been killed, some 17,000 wounded and 19,000 detained. The investigation focuses on the government’s forcing of elections in March of presidents of Egypt’s two foremost clubs, storied Cairo arch rivals Al Ahli SC and Al Zamalek SC, whose militant supporters played a key role in the toppling three years ago of President Hosni Mubarak and subsequent anti-military protests. The elections were designed to ensure that the clubs were led by regime loyalists and to block the prospects of candidates close to Gamal Mubarak, the imprisoned, neo-liberal son of the ousted president, whom the military sees as a threat to its sprawling economic and commercial interests. Al Ahli and Zamalek had resisted holding elections prior to the expected promulgation of a new sports law. 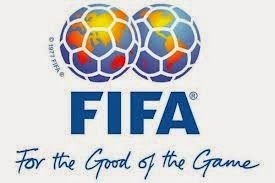 FIFA decided to investigate after the Egyptian Football Association failed to satisfactorily reply to a demand by the soccer body for an explanation of the government’s interference. Egypt’s bids for the two soccer tournaments constitute an effort to repair the country’s image badly tarnished by its abysmal human rights record. The bids could well backfire like in the case of 2022 World Cup host Qatar that is under pressure to reform restrictive labour conditions and put Egypt’s repressive regime even more under the spotlight. Egyptian government interference goes however beyond club elections. Fans have been banned from attending matches for more than two years, initially to prevent further violence in the wake of a politically loaded brawl in Port Said in February 2012 in which 74 Al Ahli fans were killed. Few doubt that the security forces and the military which was in government at the time allowed the incident to happen in an effort to cut highly-politicized, street battle-hardened soccer fans down to size. The ban has since last year’s coup against Mohammed Morsi, who is standing trial on multiple charges, including treason, and whose Muslim Brotherhood has been banned as a terrorist organization, increasingly been maintained to prevent the soccer pitch from re-emerging as an opposition rallying point. The interior ministry hopes to reduce the threat by next season allowing fans to return to stadia that are policed by private security firms rather than the security forces, widely viewed as the hated, repressive arm of an autocratic regime and a lightning rod for soccer activism. FIFA has remained silent on the ban that has everything to do with survival of the Egyptian regime and curtailing expressions of dissent. FIFA has similarly allowed its board and that of regional associations, certainly those in the Middle East and North Africa, to be populated by autocratic pawns and members of ruling families more interested in maintaining the status quo than the interests of the sport and the ideals they at best pay lip service to. The struggle for who represents Asia in the FIFA executive committee is a case in point. Asian Football Confederation (AFC) president Sheikh Salman bin Ebrahim Al Khalifa, who also heads the Bahrain Football Association, was last year elected to clean up the scandal-ridden group after its former president, Mohammed Bin Hammam, was banned for life from involvement in soccer on grounds of alleged corruption. Instead, Sheikh Salman, a member of Bahrain’s ruling family, has spent his first year in office seeking to expand his power base at the expense of soccer governance’s few reformers, among whom first and foremost Jordan’s Prince Ali Bin Al Hussein, whom Sheikh Salman in an undemocratic manoeuvre rather than a free and fair election, is seeking to replace as FIFA vice president. Prince Ali is one of the few international soccer executives who has used his position for the greater good of the game. Sheikh Salman’s ascendancy is telling in and of itself. Few international organizations would have elected as president a man who has refused to say a word about the public denunciation, detention and torture on his watch of national team players because of their participation in mass anti-government protests and the politically motivated incarceration of two soccer teams. Sheikh Salman’s silence is particularly telling at a time that controversy over labour conditions in Qatar and anti-FIFA protests in Brazil have put human and social rights on world soccer’s agenda. Hakan Sukur, an all-time Turkish soccer star-turned-controversial Islamist politician, recently highlighted the pervasiveness, even in the Middle East and North Africa’s few pluralistic, democratic societies, of the inextricable intertwining of politics in soccer and the laxity of policing by FIFA and its regional associations of their insistence in upholding the fiction that sports and politics are separate. In a recent interview, Mr. Sukur, a supporter of Mr. Erdogan’s Islamist rival, Fethullalh Gulen, a self-exiled cleric and leader of one of the world’s largest Islamist movements, disclosed that he had consulted Prime Minister Recep Tayyip Erdogan on his plans to run for the presidency of Turkish Football Federation (TFF). 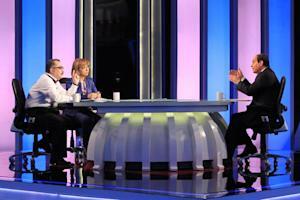 “It was normal to receive instructions behind the curtain from Erdogan about every decision. Unfortunately, at the time we did not perceive it as a result of authoritarianism, but simply Erdogan's interest in sports,” he told pro-Gulen Zaman newspaper. The 2022 World Cup is emerging as an engine of social and possible political reform in the Gulf, a region that is desperately trying to ring fence a simmering groundswell clamouring for change that has its roots in widespread social, economic and political discontent, toppled four Arab autocrats in recent years, and led to a brutal civil war in Syria. Pressure by human rights and trade union activists as well as the United Nations on World Cup host Qatar, perhaps the most stable of the six wealthy, energy-rich Gulf states, to reform its restrictive labour system is proving to be a monkey wrench that is rippling throughout the region and could spark change that goes far beyond the rights and working and living conditions of migrant labour that account for a majority of the population in much of the region. It is also sparking pressure on other states in the region. Prominent artists have called for a boycott of the Guggenheim museum being built on Abu Dhabi’s Saadiyat Island, one of several high profile museums planned to position the emirate as a sponsor of the arts and a tourism destination, in protest against the conditions of workers involved in the construction. The artists are leveraging their campaign to press for an overall change of labour conditions in the United Arab Emirates where Dubai could well be drawn into the firing line with its hosting of the 2020 World Expo. The initial signs of change are tentative and have yet to be bolstered by robust legislation and implementation but are sparking a process that is likely to be irreversible, take on dynamics of its own that Gulf regimes may find hard to control, and is part of a growing realization in the region that it cannot escape global demands for greater transparency and accountability. That realization was evident beyond the labour issue in recent weeks with traditionally secretive, major state-owned companies such as Qatar Airways and the Investment Corporation of Dubai ICD) that owns Emirates airlines among other of the emirate’s crown jewels, publishing their results for the first time to counter criticism by Western governments and airlines of unfair competition and restore investor confidence. In doing so, Dubai also laid bare one of the region’s most fundamental problems: the fact that ruling families run many of the region’s states as family corporations. ICD reported that Dubai ruler Sheikh Mohammed bin Rashid al- Maktoum had put in June 2011 ICD-controlled real estate assets worth $44 billion under his personal control. Similarly, the World Cup-driven pressure on Qatar has laid bare the region’s long-standing, largely ignored lack of workers’ rights and abominable living and working conditions. The pressure has already sparked initial social change on the soccer pitch in Qatar and the United Arab Emirates with clubs and federations that traditionally catered only to their country’s minority citizenry reaching out to foreign workers, tinkering in Saudi Arabia with restrictive rules applicable to foreign labour and the terms of labour contracts, a declared intention by the UAE to become a global benchmark of labour safety and security, and protest demonstrations by migrant workers in Lebanon. The sports outreach to foreign workers constitutes a break with a regional policy that sought to maintain Chinese walls between nationals and foreigners by minimizing social contact, segregating citizens by ensuring that they distinguished themselves with their flowing robes and head dress in the way they dressed, and positioning non-nationals as the other. In perhaps the most far-reaching indication of legal change, Qatar last week received an extensive report it commissioned law firm DLA Piper to draft on the status of labour conditions in the country and measures it should take to accommodate international criticism. Qatari officials say they are about to unveil legislation that would substantially reform their country’s kafala or sponsorship system that puts workers at the mercy of their employers. Those reforms would include transferring sponsorship from individual or corporate employers to the government, giver workers the right to seek alternative employment, and ease the exit visa system that prevents foreigners from leaving the country without their employer’s permission. The legal reforms coupled with the adoption of lofty principles by Qatari institutions such as the World Cup’s Supreme Committee for Delivery & Legacy and Qatar Foundation that ensure workers’ welfare and seek to put an end to corruption in the recruitment system that puts workers into debt even before they arrive in the Gulf state and for the Gulf unprecedented Qatari engagement with its critics are unlikely to put criticism to bed. On the contrary, they are the start of a process that like the disclosure of corporate results will highlight underlying fundamental problems and fuel demand for further reform. Short-term, human rights groups, trade unions, the International Labour Organization (ILO) and the United Nations Human Rights Council are unlikely to drop their demand for complete abolition of the kafala system. They are also likely to insist that reforms include groups not included in the measures such as domestic personnel and workers in fishing and agriculture. A report and debate in the UN Council this week in which more than 30 countries took Qatar to task on its worker and human rights record suggested that demands would not be restricted to labour issues. Representative of various governments called for further measures to combat gender inequality including a lifting of the ban of granting Qatari citizenship to the children of Qatari women married to foreigners that goes to the core of the Gulf’s state skewed demography with Qataris accounting for only 12 percent of the population that is at the heart of many of these issues, and ensure freedom of expression threatened by new, restrictive draft media and cybercrime laws. Representatives of the United States and Britain demanded the release of Mohamad Al-Ajami, a Qatari poet jailed for 15 years on charges of insulting the former Emir. The stakes for Qatar and other Gulf states under World Cup-driven pressure to adhere to international labour and human rights standards and adopt greater transparency are high. Development, including infrastructure, and the employment of sports and the arts to gain the kind of soft and subtle power capable of compensating their lack of hard power has created with the influx of foreign labour an unsustainable demography in which citizens often constitute a small minority of the population. There are no good solutions for citizenry that wants to maintain its cultural and national identity as well as control of their society and ruling family’s determined to keep a grip on their fiefdoms. Change threatens to open a Pandora’s Box. That is one reason why Gulf states have been slow in addressing the labour issue and why it took the World Cup to push it to the top of the agenda despite at least Qatari leaders like former prime minister Sheikh Hamad bin Jassim bin Jabor Al Thani admitting already in 2007, according to the Mumbai Mirror, that "it is difficult to retain the exit permit system in its existing form... it is being likened to slavery. It can't remain like this." Sports and arts policies have put the Gulf states’ warts in the spotlight and threaten to thwart the key soft and subtle power objectives of the heavy investments involved. A YouGov poll in Britain last September showed 79 percent of those polled opposed to the awarding of the World Cup to Qatar and 78 percent favouring the tournament being moved to another country. A similar survey about Qatar Airways showed that the country’s airline had succeeded where it’s hosting of the World Cup had failed: 96 percent of those polled rated the airline from positive to very positive. An Egyptian court has sentenced 12 militant soccer fans to five years in prison in an expansion of the military-backed regime’s crackdown on its Islamist and non-Islamists opponents that could ultimately re-position soccer as a major platform of protest. The fans, members of Ultras Ahlawy, the well-organized and street battled-hardened militant support group of storied Cairo club Al Ahli SC that played a key role in the popular uprising three years ago that toppled President Hosni Mubarak and subsequent anti-military protests, were sentenced in absentia for organizing an illegal gathering and vandalism. The convicted were accused of blocking a Cairo road to protest the arrest of Ultras Ahlawy members who clashed with police last October as they attempted to storm Cairo airport’s international terminal. The verdict came days after just retired General Abdel Fattah Al-Sisi, the presidential candidate likely to win this month’s presidential election who last year overthrew Egypt’s first and only democratically elected president, Mohammed Morsi, and has since directed a brutal crackdown on his opponents, defended Egypt’s recently adopted a draconian anti-protest law. The law is part of a regional trend visible in Saudi Arabia and Turkey as well as in debates in Jordan that equates protest with terrorism or categorizes it as a precursor to political violence. An Egyptian court has sentenced to death this year more than 700 alleged supporters of Mr. Morsi’s banned Muslim Brotherhood as part of a crackdown in which more than 3,000 people have been killed, some 17,000 wounded and 19,000 detained since last July’s coup. The verdict against the fans and the crackdown that involves greater brutality by security forces than was prevalent during the Mubarak comes as power within Egypt’s various militant fan or ultras groups has shifted from their highly politicized founders to charismatic young men, who are often un- or under-employed and un-or under-educated, and whose opposition to law enforcement that has made their lives difficult not only in the stadia but also in the popular neighbourhoods of Egyptian cities is visceral. “All the old people have left. There was a fight within the group. Some were kidnapped and held for three days. We were attacked with knives. People were injured. Their leader is enormously charismatic,” said a founder of one of the groups. The former ultra who keeps close contact with militant fans said a recent fall in soccer protests fuelled by a ban on allowing supporters to attend soccer matches in a bid to prevent protests was in part due to a pledge by the interior minister to next seasons replace security forces in stadia with private security firms. ‘It’s likely to be the quiet before the storm. I don’t know a single person who will vote in the presidential election. Even my parents, simple people who are not Islamists, don’t believe in what is happening. People will loose faith in the military. They are loosing faith in everything,” he said. Few young people voted in a constitutional referendum in January that seemed to indicate that Mr. Al-Sisi could count on the support of just under 40 percent of the electorate, enough to allow him to emerge as the candidate with the single largest voting bloc. Some 98 percent of the approximately 38 percent of the electorate that cast their vote in the constitutional poll, voted in favour. They did not include the tens of thousands of young men who joined the ranks of the ultras in the last four years of the Mubarak regime as the fans emerged as the foremost civic group that physically resisted the regime in almost weekly clashes with security forces in stadia during the soccer season. The clashes allowed them to vent pent-up frustration and anger against the security forces, who as the repressive arm of the regime were Egypt’s most hated institution. They’re raison d’etre was revenge and payback. The power of these alienated young men became evident within months of the overthrow of Mr. Mubarak when members of the Ultras White Knights (UWK), the highly organized radical fan group of crowned Cairo club Zamalek SC, stormed Cairo International Stadium’s soccer pitch in the 90th minute of the first post-revolt game between and Egyptian and a Tunisian team, disrupting the match and destroying goal posts and everything else in their path. The group’s founders realized that they were losing control. “These guys know the security forces are waiting for them to make a mistake. That’s why they refocused their attention on football and distanced themselves from the Salafists. I don’t know how long that will last. We could face something like Syria. Islamists will lead the next revolution. It will be an Islamic revolution, not a fight for the state,” the former ultra said. Cairo (AFP) - Ex-army chief Abdel Fattah al-Sisi was uncompromising in his first television interview since announcing his run for Egypt's presidency, insisting the Islamist movement of the elected leader he ousted was "finished". Sisi, who is expected to trounce his sole opponent in the May 26-27 election, made no attempt in the interview's first part aired late Monday to reach out to critics of his overthrow of Egypt's only freely elected president Mohamed Morsi last July. Instead he appealed for the support of the millions of opponents of Morsi's Muslim Brotherhood who protested in the days running up to his ouster, insisting that it was they, and not he, who had finished the Brotherhood as a political force. 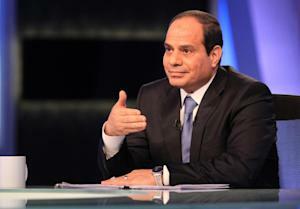 "I did not finish it, you Egyptians finished it," Sisi said. The Brotherhood was Egypt's best-organised political force for decades even though it has been banned for most of the time since its foundation in 1928, and Sisi has faced Western calls to reach out to its supporters. But challenged whether he meant the Brotherhood would no longer exist under his presidency, Sisi answered: "Yes," rejecting any idea it might have a place in the political future. James Dorsey, Middle East Expert with Singapore-based S. Rajaratinam School of International Studies, said "he has taken a hardline position by ruling out any possible reconciliation with the Muslim Brotherhood. "Obviously he catered to his power base which supports him... there is no doubt that he is extremely popular among a large section of the population." Nearly all of the Brotherhood's top leaders are in custody, among thousands of Morsi supporters who have been put on trial, resulting in hundreds of summary death sentences that have drawn international criticism. 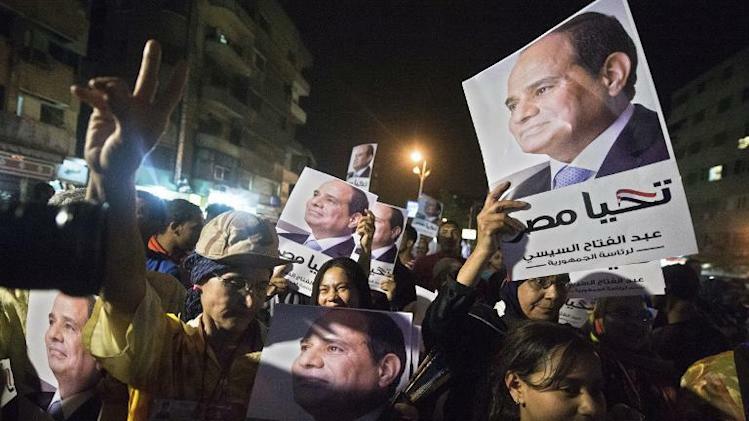 But Sisi was unrepentant about the crackdown and the tight restrictions on protests that have angered some of the key leaders of the Arab Spring uprising that toppled veteran president Hosni Mubarak in 2011. Last month, an Egyptian court even banned the April 6 youth movement, which had spearheaded the revolt. 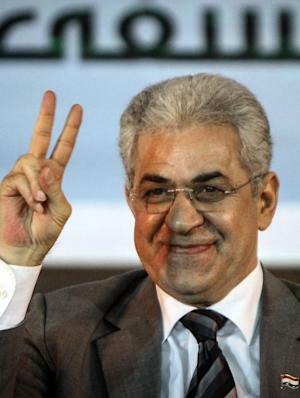 And Sisi's only rival for the presidency, veteran leftist leader Hamdeen Sabbahi, has raised concern that Egypt is returning to the autocratic practices of the Mubarak era. But Sisi insisted a controversial law adopted in November by the interim government he installed had been vital in restoring stability. "We won't be able to meet challenges in Egypt today amid this state of chaos... and one of the tools to (tackle this chaos) was the protest law," Sisi said. "He (Sisi) wants to consolidate his supporters and not win opponents," said Nevine Massaad, political science professor at Cairo University. "He is saying 'you accept me as I am or don't'. He will not win over any of his opponents by making it clear he would do anything to achieve security," she said. As the government Sisi installed has cracked down on persistent protests by Morsi's supporters resulting in clashes in which Amnesty International says more than 1,400 people have been killed, attacks by hardline Islamists, some inspired by Al-Qaeda, have multiplied. But Sisi played to the security credentials and strongman image that have endeared him to the many Egyptians weary of the turmoil and the damage it has done to the economy and its vital tourism sector. Asked by the interviewer whether he had ever been the target of any assassination attempts -- Mubarak famously survived 10 -- Sisi confided, without giving any details, that he had survived "two." Cairo University politics professor Mustapha Kamel Al-Sayyid said: "What we saw yesterday was a firm leader who knows what he wants and who will work very hard to get what he wants. "All the policies that were adopted since July 3 will continue. Nothing will change. He did not give an impression that he is a people's man." Militant supporters of Istanbul’s top three soccer clubs added muscle to thousands of trade unionists, leftists and government opponents in May Day clashes with Turkish police in what has become a battle for control of the city’s iconic Taksim Square. With 40,000 men on duty, 20,000 of which were stationed on and around Taksim, police fired tear gas and rubber bullets to prevent protesters from reaching the square. Clashes erupted in various parts of the city, including Besiktas, home to Carsi, the widely popular militant support group of Besiktas JK. Turkish media reports said 51 people were injured and 138 arrested. The significance of Taksim to both the government and its critics was highlighted by the fact that the government banned May Day celebrations on the square on alleged national security grounds but assigned an area on the outskirts of the city where the unions and others would be allowed to mark Labour Day. Taksim, Istanbul’s historic venue for May Day demonstrations and other gatherings, has been contested territory since the eruption last June of the largest mass anti-government protests against Prime Minister Recep Tayyip Erdogan since he was first elected in 2002. Militant soccer fans played a key role in those protests. The government has since banned all demonstrations from the square. Underlying the protests in what has become a deeply polarized country is a widespread sense among Mr. Erdogan’s opponents that power has gone to his head and that he since the brutal use of the police during last year’s protests has become increasingly authoritarian, using a power struggle with Fethullalh Gulen, a self-exiled Muslim preacher who heads one of the world’s largest Islamist movement to muzzle the media, give Turkey’s intelligence service powers similar to those of the secret services in Arab autocracies and subject the judiciary to government control. Few deny that Mr. Erdogan deserves credit for significantly growing Turkey’s economy, positioning it as a regional power at the crossroads of Europe and Asia and bridging the gap that long segregated secularists from religious segments of society. Criticism of Mr. Erdogan’s focuses on his haughty style of government, his more recent refusal to constructively engage with his opponents, his refusal to allow due process in what is the most serious corruption scandal since he came to office, and authoritarian moves that threaten to curtail Turkish democracy. It does not focus on Mr. Erdogan’s Islamist credentials. That is a far cry from the ‘us and them’ discussion of almost 20 years ago when the country’s economic elite moved vast sums of money out of Turkey for fear that then newly elected Prime Minister Necmettin Erbakan would turn it into an Islamic republic. The elites at the time cheered Mr. Erbakan’s removal in a silent military coup and the banning of his Refah Party from which Mr. Erdogan’s Justice and Development Party (AKP) emerged. The battle for Taksim reflects that change. It is a battle for the soul of a Turkey in which all Turks have an equal interest. It is a battle that is as much about sheer power as it is about the nature of Turkish democracy. It is a battle that is in part being fought on the soccer pitch evidenced by the participation of soccer fans as well as the banners they carried and the slogans they chanted during the May 1 demonstrations. The stakes are high for fans and go to the heart of the struggle for Turkey’s soul. In Istanbul and other Turkish cities fans denounced the government’s e-ticket system that would give it access to their personal details against the background of an effort in the past year to portray protest as a precursor for terrorism and an attempt to criminalize militant soccer groups. 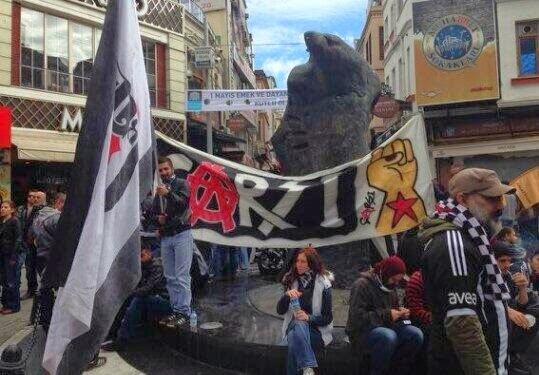 Twenty members of Carsi were last year charged with belonging to an illegal organization. Several Turkish clubs have said they would refuse to implement the e-ticket system. Executives of Fenerbahce SK, Turkey’s foremost club, said they would implement their own e-ticket system that would legally free them from the obligation to provide the government with fans’ personal data. In an indication of resistance to the system and Mr. Erdogan’s policies, fans of Galatasary sang during the May 1 demonstrations in Besiktas, the territory of one of their arch rivals, a song of Fenerbahce, another arch rival, commemorating Ali İsmail Korkmaz, who was killed in last June’s protests. The stakes are particularly high for Fenerbahce whose president, Aziz Yildirim, has been sentenced to prison on match fixing charges. Mr. Yildirim, who has consistently denied wrongdoing, was expecting to be detained after May 1 because the government feared that an earlier arrest might fuel the May 1 protests. The Fenerbahce case is at the centre of a political battle between Mr, Erdogan and Hasim Kilic, the head of Turkey’s Constitutional Court. Mr Yildirim’s last hope to avoid serving further time in prison is a pending appeal to the court on procedural ground. In a highly unusual twist of events, Mr. Kilic recently met privately with Ali Koc, one of Turkey’s foremost businessmen and one of Mr. Erdogan’s bete noirs, who is closely affiliated to Fenerbahce. In a public speech several days later, Mr. Kilic frontally denounced the government’s efforts to undermine the judiciary’s independence, sparking a public row between the court and the prime minister’s ruling AKP party.